Go for Gold was thrilled to hear that we have a talented soccer player in our midst. 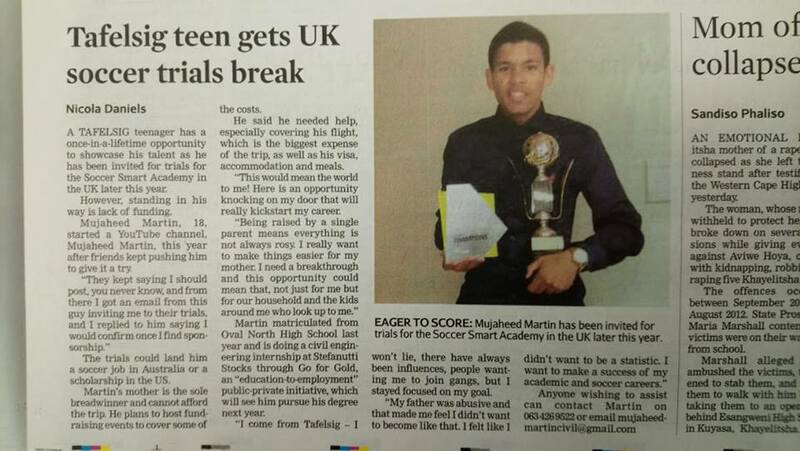 Mujaheed Martin, a Grade 11 student in Phase 1 of the Education-to-Employment programme has been invited to attend the Smart Soccer Academy soccer trials in the UK later this year. Mujaheed comes from Tafelsig in the Western Cape and is currently fundraising toward the flight cost to get him to the UK mid December 2018. On Monday, 20 August 2018 Pippa Hudson, the morning radio presenter from Cape Talk interviewed Mujaheed. Listen to his interview here. As a result of Mujaheed graciously mentioning that he is on the Go for Gold programme, Cape Talk was interested to hear more about our programme. Our Fundraising and Communications Manager, Karen Rademeyer spoke to Pippa Hudson on Tuesday, 21 August 2018. Listen to the interview here. We wish Mujaheed all the best in achieving his goals, academically and with his soccer.